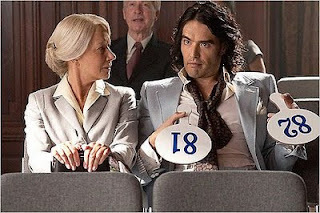 Fourth Row Center: Film Writings by Jason Bailey: On DVD: "Arthur (2011)"
So it may be safe to say that young audiences more familiar with the antics of Russell Brand than Dudley Moore will enjoy this new version. This reviewer cannot accurately say, because, in spite of my valiant efforts to do so, I was simply unable to separate the two pictures. I can’t judge this Arthur on its own merits, because I’ve ingested the original so many times, over so many years. Maybe it’s better for Arthur and Naomi (she’s Naomi this time, instead of Linda) to meet when she’s giving unlicensed city tours instead of shoplifting from Bergdorf’s. Maybe it’s better for her father to only have four lines (and all straight lines at that). Maybe it’s better without Aunt Martha. Maybe the comparatively over-elongated ending is better. Maybe it is better to open it with the police chasing Arthur and Bitterman in a faux-Batmobile. Maybe, maybe, maybe. These things could all be true. Another writer will have to make that call. I’m too close to this thing. It’s not that the picture is without its charms. The primary logic for not discounting the enterprise entirely was that it was so very well-cast, and most of the actors perform admirably. Russell Brand apparently became a love-him-or-hate-him presence at some point in the last year or so; I’m not sure why, since he’s charismatic and usually funny, and he does pretty well here. The casting of Helen Mirren in John Gielgud’s Oscar-winning role of Hobson (there his valet, here his nanny) is clever and mostly successful; indie darling Greta Gerwig couldn’t be more likable as the girl from Queens who steals his heart. The role of Susan Johnson, his arranged wife, has been greatly expanded—presumably to accommodate Jennifer Garner, who does her best but never quite manages to pull a character out of her caricature. The heart is cheered by the presence of Luis Guzman as Bitterman and Nick Nolte as threatening would-be father-in-law Bert Johnson, but neither of those gifted performers are given very much to do. The screenplay by Peter Baynham (a frequent collaborator of Sacha Baron Cohen and Steve Coogan) nicks a few lines from Steve Gordon’s original, but not nearly enough; though some exchanges have a similar ring (“You’re drunk, Arthur.” “No, I have remained drunk since our last encounter”), and occasional scenes have a nice, screwball snap (like his visit to his mother), many of the comic situations are strained and silly. (I’m thinking particularly of the business with Nolte, Brand, and the buzzsaw.) And the ending is a total fumble, an unsuccessful attempt to round off the few hard corners of the original picture. Strangely, the dramatic beats tend to play smoother than the comic ones; the film takes Arthur’s eventual falling out with Naomi (and his final scenes with Hobson) seriously, and is better for it. Again, maybe those approaching this material fresh will share none of these complaints. But its hard to judge the film on its own terms when it doesn’t establish any for itself; it never really finds a rhythm or comic ingenuity of its own, since it’s so busy trying to both “reimagine” its predecessor and top it. Arthur is not a disaster. It has its moments, even. But if this were a new, heretofore unknown movie, it’s safe to say no one would be remaking it in 30 years. "Arthur" makes its DVD and Blu-ray debut today.